What was the 529 and ABLE market sizing as of 3Q 2018? 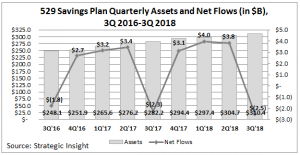 – Estimated 529 savings plan net outflows were $2.5 billion in 3Q 2018 compared to net outflows of $2.3 billion in 3Q 2017 and net outflows of $1.8 billion in 3Q 2016, which aligns with steady demand for 529s and more parents successfully using 529s for their intended purpose of qualified higher education expenses (tuition, books and room & board). From an industry asset level and account perspective, 529 saving plans continue to reach year-over-year highs. 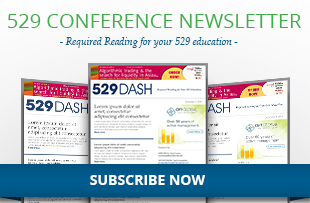 Therefore investor interest in 529 college savings plans and saving for education in an efficient manner in terms of tax, financial aid and estate planning continues to rise, and especially as part of year-end tax planning and college financial planning. For questions, commentary or feedback on the data, please contact Paul Curley at paul.curley@strategic-i.com or 857-222-3730.